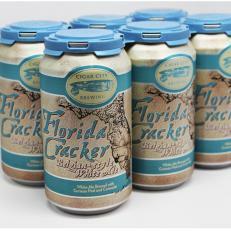 Cigar City’s warm-weather appropriate Florida Cracker white ale is dedicated to the state's colinial-era Scot-Irish settlers. This Belgian-style beer, made in Tampa, is infused with orange peel and coriander, giving it a bright, citrusy flavor that pays homage to the official state fruit, the orange. It has become a staple of pool parties and beachside barbecues across the state.